For the film festival, see ÉCU The European Independent Film festival. The first écu, issued by Louis IX of France, in 1266. The term écu (French pronunciation: ​[eky]) or crown may refer to one of several French coins. The first écu was a gold coin (the écu d'or) minted during the reign of Louis IX of France, in 1266. Écu (from Latin scutum) means shield, and the coin was so called because its design included a shield bearing a coat of arms. The word is related to scudo and escudo. The value of the écu varied considerably over time, and silver coins (known as écu d'argent) were also introduced. When Louis IX took office, France still used small silver deniers, which had circulated since the time of Charlemagne to the exclusion of larger silver or gold coins. Over the years, French kings had granted numerous nobles and bishops the right to strike coins and their “feudal” coinages competed with the royal coinage. Venice and Florence had already shown that there was demand for larger silver and gold coins and in 1266 Louis IX sought an advantage for the royal coinage by expanding it in these areas. His gold écu d'or showed a shield strewn with fleur-de-lis, which was the coat of arms of the kings of France at the time. These coins were valued as if gold was worth only 10 times as much as silver, an unrealistic ratio which Edward III of England had unsuccessfully tried to use. It failed again, Louis IX’s silver coins were a great success but his gold was not accepted at this rate and his successor discontinued gold coinage. Philip IV reintroduced gold coinage to France in 1296 and began a sequence of extravagantly designed but rapidly changing types. These coins were generally named for their obverse design and the écu a la chaise which Philip VI introduced in 1337 showed a shield with the coat of arms of the kings of France beside the seated king. Philip IV spent vast quantities of these coins subsidizing his allies in the Netherlands at the outset of the Hundred Years' War and this coin was widely copied in the Netherlands. Charles VI ended the practice of frequently changing gold coin designs, but not of tampering with their weight and value, with his écu à la couronne in 1385. It is again named after the shield on the obverse, which now has a crown above it and the modern coat of arms of the kings of France with three fleur-de-lis. Charles VI’s father had scored major gains against the English but had passed the cost on to his children. The government of the child Charles VI abandoned his father’s sound money policy by replacing his gold franc a cheval. The new écu à la couronne weighed less than the franc but its value was increased from one livre, i.e. 20 sous, for the franc to 22 sous 6 deniers for the écu. Not only was this a devaluation, but while the franc had been identified with its valuation of one livre the valuation of the écu à la couronne was subject to manipulation. In 1475, Louis XI created a variant of the écu à la couronne called an écu au soleil because the sun now appeared above the shield. The process of devaluation continued. In 1515 the écu au soleil was valued at 36¾ sous but its value was increased to 45 sous by 1547 even though its weight and fineness had been decreased in 1519. The écu design continued, essentially unchanged, on French gold coins until 1640 when the louis d’or replaced it. In the second half of the 1500s gold and silver imported from Spanish America impacted the French economy, but the king of France wasn’t getting much of the new wealth. He responded by revaluing the écu d’or in stages from 45 sous in 1547 to 60 sous, i.e. 3 livres tournois, in 1577. This just made the inflation caused by the increase in the supply of gold and silver worse and the Estates General, which met at Blois in 1576, added to the public pressure to stop currency manipulation. In 1577, Henry III of France agreed to stabilize the écu d’or at 3 livres tournois and to adopt a new monetary system with prices quoted in écu. As part of this system, he introduced quarter and eighth écu coins struck in silver. The types of quarter and eighth écu d’argent paralleled those of the écu d’or, with the royal arms on the obverse and a cross on the reverse. For the first time in French history, these coins had a mark of value with IIII or VIII placed on either side of the shield. 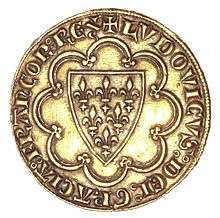 Royal coins struck at mints in Navarre and Béarn added local heraldry to the fleur-de-lis of France. Feudal coinages at Bouillon and Sedan, Château-Renaud, and Rethel also struck quarter écu’s with their own arms replacing the royal arms. This still didn’t give France a coin which could compete with the thalers which were popular in Germany. Moreover, French coins were still made by hand so precious metal could be illegally shaved from the edges of the coins before passing them on. Finally, the écu d’or was made of 23 carat gold, which was not the international standard. Louis XIII fixed all this. He installed coinage making machinery in the Paris mint and replaced the écu d’or by the Louis d'or in 1640. In 1641 he introduced a thaler sized silver coin originally called a Louis d’argent and valued at 3 livres tournois. This value was associated with the stabilization of the écu d’or at that value in 1577 and the new silver coin came to be called an écu. This is a bit curious since the just discontinued écu d’or was now valued at more than 5 livres and the old hammered silver quarter écu was struck until 1646 and valued at 1 livre. From 1690 to 1725 rates were unstable and new écus were issued, and existing écus revalued. After 1726 the final écu remained stable at six livres tournois. The silver écu was further broken down into a 1/8 value coin (huitième d'écu), 1/4 value coin (the quart d'écu) and a 1/2 value coin (the demi-écu). All had the king’s bust on the obverse and the royal coat of arms on the reverse. For more on the 17-18th century currency system, see Louis d'or, livre tournois and Italian scudo. The écu disappeared during the French Revolution, but the 5-franc silver coins minted throughout the 19th century were but the continuation of the old écus, and were often still called écu by French people. The écu, as it existed immediately before the French Revolution, is approximately equivalent (in terms of purchasing power) to 20 euro or 25 U.S. dollars in 2006. Wikimedia Commons has media related to écu. The fact that the coin's name was the same as ECU, the abbreviation of the European Currency Unit, may have assisted the ECU's adoption by France despite its being an acronym of English words. ↑ Ede, James (1808). A View of the Gold and Silver Coins of All Nations (2nd ed.). London: J. M. Richardson. ↑ R. L. in Palgrave, Robert Harry Inglis, ed. (1901). Dictionary of political economy, Volume 1. London: Macmillan. OCLC 562733020. ↑ Coins In History, John Porteous, page 89. ↑ Coins in History, John Porteous, page 164. ↑ Coins In History, John Porteous, page 182. ↑ Coins In History, John Porteous, page 210.